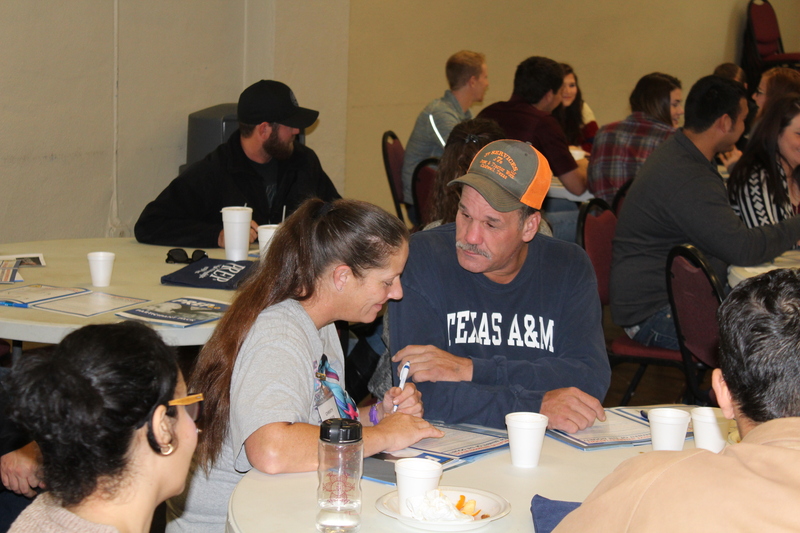 College Station–Strengthening Families of the Brazos Valley hosted their first SYNERGY ( marriage and relationship retreat) of 2019 in February. 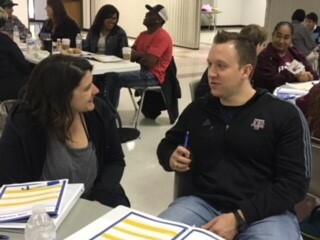 Over 70 couples from around the Brazos Valley attended the two-day retreat which featured PREP [Prevention and Relationship Enhancement Program]: Successful relationships. Successful lives. SYNERGY provided couples with the tools they need to encourage, inspire and rejuvenate their relationships. Couples also had the opportunity for one-on-one private times to provide an environment to process with each other on how they can apply those tools and discussions to move toward a deeper connection. Melanie Seltzer and Charles Micheal are engaged and found the “The Speaker Listener” session to be very helpful. “that workshop helped us to tackle recent issues that we had been going through and just by attending this retreat we have already applied the techniques learned to come to a resolution. I have learned how to stop and “listen” to what she’s saying rather than paraphrasing and formulating an answer before she has asked the question.” said, Charles. Couples were treated to two catered meals, light breakfast and desserts throughout the weekend. Many couples won great give-aways (tour and wine tasting, gift certificates and couples painting sessions) donated by local businesses in the Brazos Valley. Plans are already underway for the next retreat which will be held in the Spring in Grimes County. There are no fees for the retreat. The retreat and SFBV’s programs are fully funded by the Department of Health and Human Services, Administration for Children and Families. Funding for this project was provided by the United States Department of Health and Human Services, Administration for Children and Families, Grant: #90FM0099. These services are available to all eligible persons, regardless of race, gender, age, disability, or religion. A Synergy couple practices the “Speaker Listener” activity. Hearne, TX–There was a certain ‘Synergy’ in the air in Hearne during the first weekend in November. 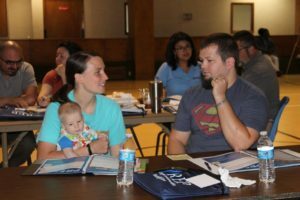 More than 50 married, engaged and dating couples from around the Brazos Valley attended Strengthening Families of the Brazos Valley’s marriage and relationship retreat. 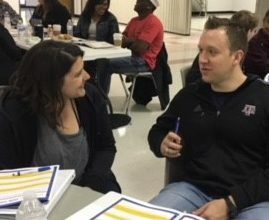 The two-day retreat held at the First Baptist Church Activity Center was designed to help couples to effectively communicate, work through conflict in a skilled way and to be affectionate with each other. The retreat also created an environment where couples listened to one another by participating in various individual and group workshops. Couples had the opportunity to right the wrongs of the past by repairing breeches of trust for the future. Newlyweds, Melissa Busby and Justin Busby have only been married for three weeks and decided to attend the retreat. “We already had a strong and healthy relationship but by attending the retreat reconfirmed our love for one another. It helped us to build a stronger foundation with each other and how to communicate effectively. We both have children from previous marriages, but the workshops helped us to come together as a family when it comes to solving problems and doing family activities.” said, Justin. Couples walked away with tools they need to experience a deeply fulfilling, passionate and lasting partnership. The retreat made it easy and enjoyable to have deep conversations in a safe and structured environment. Dennis Hoffman and Maria Medrano have been dating for 10 months and found the communication workshop was very helpful to them. “I realized that even though we are constantly talking, we had not communicated with each other about the more important subjects(finances, relationships, goals). 10 months have really been a date, but now we are heading in the direction of a more serious relationship. The retreat provided great tools for the future that we can use in the event we do run into real or more serious issues or experiences.” said, Maria. In addition to fulfilling their love, couples also ‘filled-up’ their tummies with catered meals on Friday and Saturday. Some even won great giveaways donated by businesses from around the Brazos Valley! SFBV hosts the retreat in the five counties it serves (Brazos, Burleson, Grimes, Madison and Robertson) and each retreat has shown a spike in attendance. “This was the 7th retreat and it has grown both in content and in numbers. The numbers have increased primarily to the Texas A&M University’s eBlast[email] that we started using last fall, but I think we’ve also grown due to the increased awareness about SFBV in the community. We’ve tweaked the content a couple of times, but this last retreat[Robertson County] was the first one we actually increased the content for.” said, Laurie Naumann, Program Manager. The programs and retreats are fully funded by the U.S. Department of Health and Human Services, Administration for Children and Families. For more information about SFBV’s programs and future retreats, please visit their website: families.tamu.edu or email, sfbrazos@gmail.com. SFBV: We got your backs! A participant is all smiles after receiving her backpack at the Burleson County Back-to-School Blast. 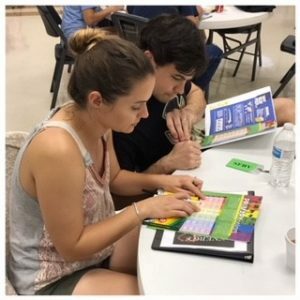 College Station, Tx–It was a busy two weeks from August 6th-August 18th for the Strengthening Families of the Brazos Valley program. Staff members and volunteers traveled over 100 miles across four counties to deliver over 500 free backpacks for children of all ages throughout the Brazos Valley. “It’s a great service for the community and it’s a way for us to give back to the people who support us and to let the communities know that we are here for them when they need us.” said, Laurie Naumann, SFBV Program Manager. In addition to the backpacks, many counties offered health screenings, free school supplies and valuable resources for parents. Lisa Williams has three children in Navasota I.S.D. “I’ve been attending this event for at least four years now in Grimes County and so far this year’s back to school fair was the best one. There were so many vendors with valuable information for parents and students. 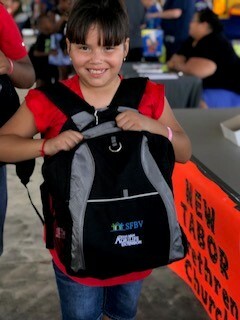 And the free backpacks provided by SFBV was much appreciated. It’s great to have a program that cares about the community. It’s also a blessing in disguise for many parents who can’t afford to get their children a backpack and school supplies to start the new school year.” said, Williams. SFBV is a program within the Texas A&M AgriLife Extension Service and provide free services to families in Brazos, Burleson, Grimes, Madison and Robertson Counties. They offer courses to individuals and couples 18+ in Parenting and Financial Education also known as Money$ense. The program also offers a two-day marriage retreat known as Synergy to married, engaged or dating couples. The program is funded by the United States Department of Health and Human Services, Administration for Children and Families, Grant: #90FM0099. These services are available to all eligible persons, regardless of race, gender, age, disability or religion. For more information about the program or Synergy, visit families.tamu.edu or email, sfbrazos@gmail.com. A Synergy couple finds their personality color during the Personality session. Madisonville,Tx–Two days of 100-degree heat didn’t stop over 40 couples from attending SFBV’S first ever marriage and relationship retreat in Madisonville on July 20th and 21st. The day and a half retreat helped couples around the Brazos Valley and couples as far as Edinburg, Austin and Humble, Tx to reaffirm their love, improve intimacy, gain healthy (effective) communication skills and have fun in their relationship. Virginia Redwine and Landon Johnson are two months away from their wedding and found the “Speaker/Listener” session most effective. ” I learned that content can be overshadowed by delivery. Your delivery has to be just as important if not more important than the content or information you are trying to relay. No matter how good the information is that you are trying to relay, if you can’t find a way to make it palatable to your partner, then it’s in vain.” said, Johnson. The retreat is not a substitute for marriage therapy. It’s designed to provide couples with the tools they need in order to have a healthier relationship and assist couples with their emotion connection, and closeness. Jon and Sandie Bennett have been married for more than 35 years and learned so much by attending the retreat. “The one of many things I can take away from the retreat is that it awakened me to reassess some things I already knew that maybe I hadn’t been applying very well or maybe I forgotten to apply and it’s time to rethink and reapply some things learned at the retreat to my life. We’ve been married a long time and we presume too much along the way and it’s time to rethink how we live each day and the “Personality” session caused me to rethink everything on what we do and why we do it. I think now it’s going to be a much better time for me and Sandie from here on.” said, Bennett. Couples were treated to two catered meals and many walked away with great give-aways that were donated by businesses in Bryan-College Station and Madisonville. Jubal and Evonne Garcia traveled 6 hours to attend the retreat and had never eaten cheesy chicken spaghetti! “This was our first time having this type of spaghetti and it was absolutely delightful. We are going to try to make this dish when we get home.” said, Garcia. SFBV program serves five counties: Brazos, Burleson, Grimes, Madison and Robertson. The next marriage and relationship retreat will be in Robertson County in November 2018. More details will be posted as soon as they become available at families.tamu.edu. The retreat was fully funded by the United States Deparment of Health and Human Services, Administration for Children and Families, Grant: #90FM0099. These services are available to all eligible persons, regardless of race, gender, age, disability or religion. Bryan, Tx–Strengthening Families of the Brazos Valley hosted their 5th marriage and relationship retreat at St. Joseph’s Parish Activity Center over the weekend. The retreat was designed for couples wanting to maintain a healthy relationship and to help couples reach their relationship goals in a reasonable amount of time through intense but fun workshops. Brittany and Curtis Allen have been married for three years and glad they attended the retreat. “The retreat gave us the opportunity to have conversations that we wouldn’t have had otherwise. We learned so many new things about each other that we didn’t realize before or just had simply overlooked. It opened our eyes to a whole new perspective about each other.” , said Brittany. The couples who attended the retreat participated in inter-active workshops and other team building activities. Throughout the two days, couples discovered new ways to truly listen to one another, communicate effectively, forgive and heal. They found ideas, tools and resources to make their relationships better and happier. 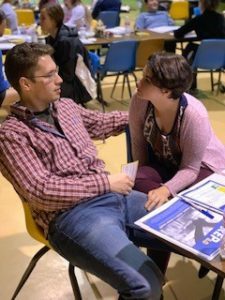 “We [Samantha Kimball and Joshua Hughes] are just nearly two years into our relationship and some couples have been in relationships for decades but whatever the case may be, as a couple you still need to set aside time to talk about issues you may have. Everyone can work harder to have better communication and confrontational skills so you can preempt problems before they start. Always remember you are both on the same team when you do have problems and work together to solve those problems.”, said Joshua Hughes. Couples were treated to two catered meals and some lucky couples walked away with great door prizes and gift cards donated by local businesses in the Brazos Valley. Plans are already underway for the next retreat which will be held in July 2018. More details will be posted when they become available at families.tamu.edu. The retreat was fully funded by the United States Department of Health and Human Services, Administration for Children and Families, Grant: #90FM0099. These services are available to all eligible persons, regardless of race, gender, age, disability, or religion. Couples participate in a Synergy workshop activity. Caldwell, TX–The inclement weather didn’t stop some Brazos Valley couples from becoming “Synergized” over the weekend. 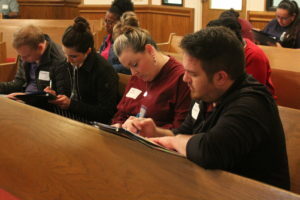 Strengthening Families of the Brazos Valley hosted Synergy: Marriage and Relationship Retreat on Friday and Saturday at the Elizabeth Lutheran Church in Caldwell. The two-day retreat focused on ‘strengthening’ marriages and relationships. Couples and individuals participated in a series of interactive workshops which featured the SFBV’s staff who shared their insights and knowledge on healthy relationships and other topics. Couples also learned how to foster good communication, work as a team to solve problems and how personality affects a relationship. 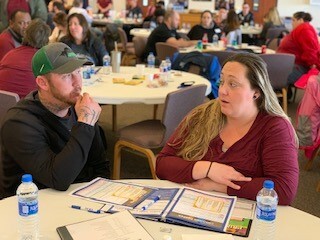 Brandon and Victoria Sandage have been married for nearly two years and they enjoyed the “Speaker/Listener” workshop and will use the techniques learned in their relationship. “We learned a great bit of information to use now and in the future. For example, the way to have a conversation amid an argument where there is one speaker at a time and one listener at a time. This allows both of us to communicate our feelings effectively.”, said Victoria. SFBV has held retreats in Brazos, Grimes and Robertson Counties but this one was the largest ever with over 80 participants in attendance. “Outstanding support from Burleson County and effective marketing strategies contributed to the large turnout. I also have great participants in my program who attended the retreat. They are ready and eager to learn how to strengthening their marriages, relationships and families.”, said Holly Narro, SFBV’s Program Coordinator for Burleson County. All participants were treated to catered meals and enjoyed taking pictures at the SFBV’s photo booth. Many couples walked away with great giveaways including a night’s stay in a King Suite at the College Station Hilton, a gift card donated by Walmart in Caldwell and a wine tasting and tour for four at Messina Hof Winery in Bryan. The retreat was fully funded by the Department of Health and Human Services, Administration for Children and Families. Plans are already underway for the next retreat in Bryan, TX in April 2018. Navasota, Tx–Strengthening Families of the Brazos Valley (SFBV) hosted Synergy: Marriage and Relationship retreat in Navasota this past weekend. Couples and individuals participated in interactive workshops which focused on dedication, self-exploration, skill-building, friendship and commitment. In addition, participants received tools which they could use to help them to create and maintain healthy relationships and families. Peggy Richardson-Johnson enjoyed the two-day retreat and hate her husband couldn’t attend. “We have been married for 20+ years but today I learned how to communicate effectively, work as a team to resolve problems and to recognize hidden issues before it develops into a large or an unmanageable issue. I will utilize the tools presented today in my relationship to enhance my relationship with my husband, Harry” said, Johnson. Participants were also treated to catered meals and many walked away with great giveaways donated by local businesses in Navasota and Bryan-College Station. The retreat is totally funded by the United States Department of Health and Human Services, Administration for Children and Families. Plans are already underway for the next retreat which will be held in 2018 in Burleson County. Hearne, Tx–Some Robertson County couples went to church over the weekend…not to save their souls but to “save” or enhance their relationships. Strengthening Families of the Brazos Valley hosted their second marriage and relationship retreat at The First Baptist Church in Hearne. The two-day retreat featured PREP[Prevention and Relationship Enhancement Program]–Successful relationships. Successful lives. Couples participated in sessions of interactive workshops to learn how to resolve conflict, communicate effectively, to identify issues and hidden issues as well as to have fun and to embrace their individual personality in their relationship. Shevonne and Michael Phillips said they were glad to attend the retreat and the sessions were beneficial. “My favorite session was the Speaker Listener Technique. We are guilty of paraphrasing what’s being said before it’s actually “said” and learning to listen first before thinking about a response or how to respond as that person is talking. My wife and I will start practicing that technique in our relationship.”, said Micheal Phillips. Couples were also treated to three catered meals and many won fabulous door prizes donated by local businesses in Hearne and Bryan-College Station. Synergy was held in Brazos County back in March and will be hosted in Burleson, Grimes and Madison counties in the near future. The retreat was fully funded by the United States Department of Health and Human Services, Administration for Children and Families. College Station, TX–Summer Break is almost over and most children in the Brazos Valley will start school in a few weeks. To help parents, several local agencies found a way to assist families and students as they prepare for the new school year. Strengthening Families of the Brazos Valley, Texas A&M AgriLife Extension Service [ Brazos Valley Injury Prevention Coalition], Big Brothers Big Sisters, TxDot and Central Baptist Church joined forces to present Back to School Family FunFest on August 8th at the Family Life Center of Central Baptist in College Station. The event helped nearly 300 kids to prepare for the new school year by providing items such as backpacks, identification cards and health screenings. Cindy Kovar, Project Coordinator II for BVIPC, said, “The purpose of the event is to provide parents and guardians with information about safety and health issues as well as information about resources that are available in the community for families and children. 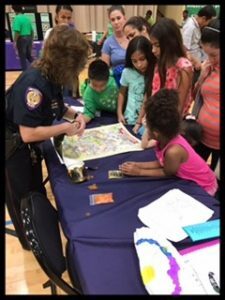 In addition, over 100 local agencies were on hand to provide nearly 200 parents with information and community services and resources. 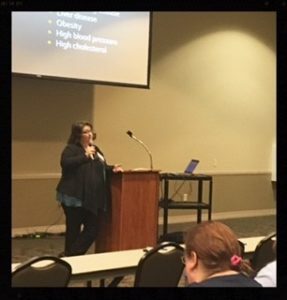 Bryan,Tx–Strengthening Families of the Brazos Valley participated in Every Victim, Every Time’s 11th Annual Conference in Bryan at the Brazos County Expo Conference on Tuesday and Wednesday. The two-day conference provided law enforcement, prosecutors, medical staff, teachers, social services agencies, mental health professionals and other agencies working with crime victims an opportunity to explore and learn valuable information about victim issues related to the criminal justice system. Laurie Naumann, SFBV’s Program Manager, presented a workshop on ACEs[Adverse Childhood Experiences that can leave tremendous, lasting effects on children’s health and well-being]. “I hope those in attendance came away with a better understanding of what adverse childhood experiences are and how both children and adults, including themselves, can be affected by them. I also hope that they acquired some tools that will help them be more effective in their work when dealing with people who have experienced ACEs–whether victim or perpetrator,” said Naumann. SFBV also had a presence in the Exhibit Hall of the Expo Center. Staff members greeted , introduced the SFBV project and handed out goody bags to the more than 700 attendees. SFBV is funded by the U.S. Department of Health and Human Services, Administration for Children and Families. The project serves Burleson, Brazos, Grimes, Madison and Robertson counties.